Google Started a New Way of Promotion of Google Chrome - Above Black Bar Navigation Bar - Do You Like It? 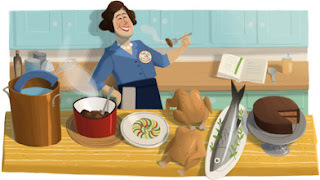 What do you think about this new blue line on Google.com. I personally feel Google want to promote their browser more and more that's why we are seeing this promotional text for Google Chrome on the Home Page of Google. So, Do you like this idea? You can share your valuable thoughts about this. Last PR which was second PR update for the year 2012 was happened on 3rd May, 2012. Now, third time, Google update Page Rank on 2nd August 2012. Many webmaster are discussing about the Page Rank, some got increase in Page Rank and some got decrease in Page Rank. Blogging Alerts which was previously PR 1, now got PR 2. When will be Next (Fourth) Page Rank Update for Year 2012? Normally, Google updates PR four times in a year. So, as per previous assumption for this year, I think next Page Rank update will be in November 2012 or December 2012. How to Increase Page Rank for a Website? If you want to increase your website Page Rank then try to make some good backlinks. I will prefer write unique content and make natural backlinks because good content will always got natural backlinks. And, I am sure If you made some quality backlinks then Google will surely assign good PR for your website. 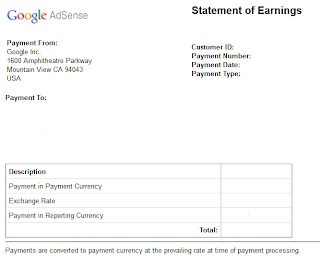 How Google Adsense Statement of Earnings Format is Looking? If you do not know, How Google Adsense, Statement of Earnings is looking? then you can get knowledge of Google Adsense Statment of Earnings from here. 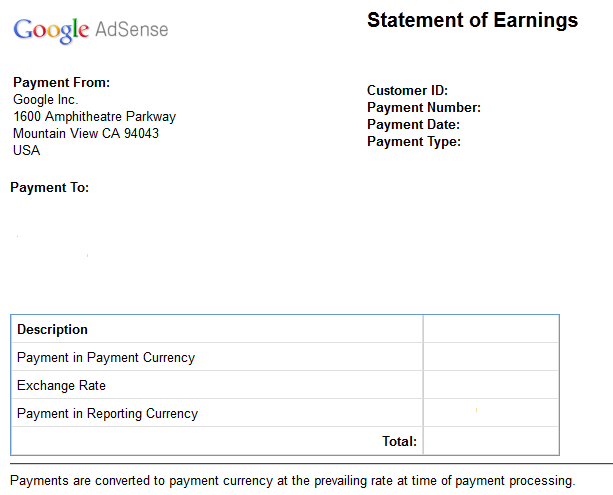 If you are a publisher of Google Adsense and earned $100 or above then you will get Statement of Earnings as follows. Each month Google issued payment from the following address. Hope you are receiving or will receive a good amount of money from Google Adsense. Google Panda Refresh on 20th August 2012 - We Can Say it Panda 3.9.1 or 4.0 - What Do You think? Last, Google Panda 3.9 refreshed on 24th July 2012. For month of August 2012, Google again refreshed Panda on dated 20th August 2012, which affects ~1% of queries. Did you notice any change in your Google rankings after this new Panda refresh? I think now Google updating Panda on every month, as it is happening from last many months. We Can Say it Panda 3.9.1 or 4.0 - What Do You think? We can say it Google Panda 3.9.1 or Google Panda 4.0. What do you think about new Panda update? Share your thoughts! Do You Know What Did Yahoo Behind the 2012 Olympic Games? As Google was busy for making doodle for each and every day for London Olympics 2012. Similar, Yahoo was also busy for updating the news related to London Olympics 2012. Yahoo! published The Yahoos Behind the 2012 Olympic Games, according to this Yahoo received the following figures in terms of traffic. And I think these are amazing traffic figures. The 2012 Olympic Games were amazing, in more ways than one. Yahoo! surpassed 3 billion page views and reached 150 million unique visitors worldwide across computer, mobile and tablet platforms. The Yahoo! Sports team delivered a 24/7 Olympics experience with 25 local sites and 12 languages integrated with social features, essential stories, real-time data and gaming. Meet some of the team responsible for bringing the world the 2012 London Games: engineers, product and marketing managers from Yahoo! Sports, Mobile and Connected TV! Hope Google will also share their traffic figures for London Olympics 2012 . What is Yahoo! Axis? How to Install Yahoo! Axis? Do You Like Yahoo! Axis a Different Type of Browser? Yahoo! Axis is a new type of web browser. Yahoo, launched Yahoo! 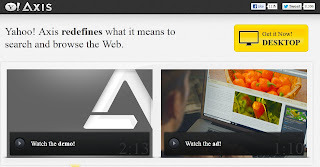 Axis, a new type of desktop browser extension and mobile browser on May, 23rd 2012. According to Yahoo, Yahoo Axis offers a faster, smarter search with instant answers and visual search previews. How to Install Yahoo Axis! in Your Desktop? To install Yahoo! Axis on your personal computer then just visit Yahoo! Axis and follows the instructions. Do You Like Yahoo Axis? Yahoo! Axis is looking good and I experienced different type of browsing while using Yahoo Axis. You can also share your valuable thoughts about Yahoo! Axis by giving comments! How to Manage Google AdSense Account with Multiple Users? Google Adsense provides a very good opportunity for those who want to make admin to someone else in Adsense. You can add multiple users in Adsense who can access one Adsense account. You can make admin to your business partners, friends, employees or any other who is very close to you. This service is launched by Adsense in July 2012. Steps for Making Admin to Others in Google Adsense? (1) Log on to your "Google Adsense" account. Google Adsense provide a very useful and helpful section for process for making Admin to someone else. Previously, there was only one language i.e. English for Google Voice Search. Now a good news Google Voice Search Added 13 new languages. Hope there will be one of your national language, which Google added recently in voice search. Did you try Google Voice Search in the above mentioned languages? What is your experience for using these languages in Google Voice Search. You can share your valuable comments! What are Facebook Trendy Articles? "Trendy Articles" are one of the trick by Facebook to promote their sponsors (we can say ads) Actually Today, I was using my Facebook account and I found a Trendy Article is showing on my Facebook Timeline which I think a sponsored ads by Facebook. What do You Think Its a Good Idea to Promote Ads? I think Facebook completely want to grow their ads network and want to do anything to promote their ads. As I know, Facebook ads are not successful and their conversion rate is very low. Hope this method of ads will work for Facebook as they already tried showing ads after logout. Do you like this idea by Facebook? You can share your valuable thoughts!!! What is App Center? Find Great Social Games - Showing on Facebook.com - Do You Like New Home Page of Facebook.com? What is Facebook App Center? If you are using Facebook.com then you will notice Facebook has changed their Home Page from last two three days. 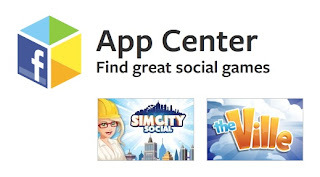 A new image containing App Center (Find great social games) is showing on the home page on the Facebook (Previously there was a mobile photo which is now replaced by this image.) You can find great social games by clicking this image. Do You Like the New Home Page of Facebook? I personally do not like the new home page of Facebook and it is looking very odd. You can also share your view about the new look of Facebook.com's Home Page. Recently, I write a post about No Doodle for Indian Independence Day. Update, Google made a beautiful doodle for Indian Independence Day. A peacock is looking very beautiful and best suited doodle for Indian Independence Day. Happy 65th Independence Day to all readers! Google did some changes with I'm Feeling Lucky Button. If you hover your mouse over I'm Feeling Lucky button then you will notice it will change to I'm Feeling Wonderful, I'm Feeling Stellar, I'm Feeling Artistic, I'm Feeling Trendy, I'm Feeling Hungry, I'm Feeling Playful, I'm Feeling Puzzled and I'm Feeling Doodly respectively. 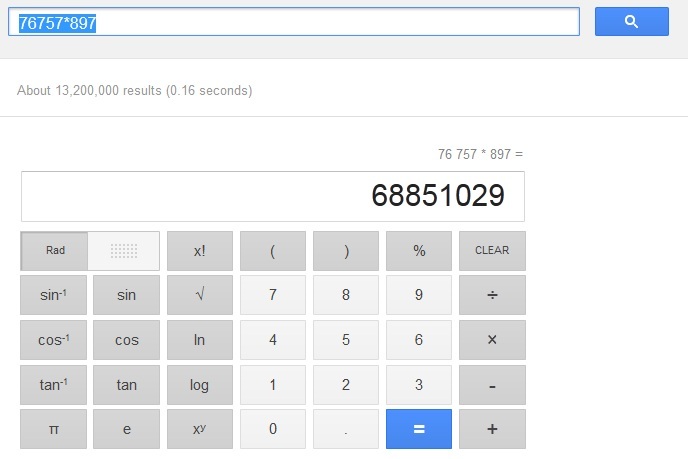 Google added new 8 buttons which are very useful and interesting. If you do not know about these buttons then you can get the meaning of these buttons from here. 3) I'm Feeling Hungry: I'm Feeling Hungry button will return the search of the nearest restaurants to you. 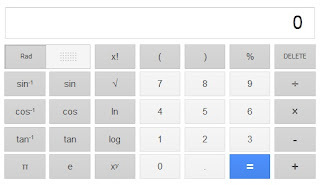 I was Using Amazing Tricks with Google's I'm Feeling Lucky Button - How to do that Now? 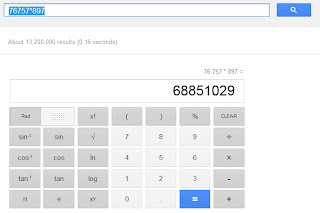 If you were using I'm Feeling Lucky button for amazing tricks then you can also use it just off the Google Instant. It is very surprising Google India did not make any Google Doodle for independence day i.e 15th August 2012. I was just waiting for Google Doodle Independence Day as Google made for the last year (15th August 2011) which as follows. Why Google India Did not make Doodle for Independence Day? I think Google India was busy with some another tasks that may be one of the reason or only Google India can answer this. Anyhow, hope Google India will made best doodle for the next year Independence Day on 15th August 2013. Google's New Blue Favicon for Google.com - Did You Like New Favicon Introduced by Google? Recently, I wrote a post about Google Adsense New Favicon. I was just thinking Google introduced new favicon for Google Adsense only. But Now, I checked Google also changed their favicon for www.google.com which is blue in color. Did You Like Google's New Blue Favicon? I think you will surely like this favicon which is blue in color and looking very simple and beautiful. Is it Testing by Google? 2) Search any query something like 90+90 then you will find a new Google calculator interface will open from where you can use Google as proper calculator. If you are a publisher of Google Adsense then you will notice Google has changed the Favicon for Google Adsense. The new Favicon.ico is matched with the Google Adsense template and its looking very good. Did You Notice Google Adsense Changed the Favicon? Today, I noticed it. Did you notice it? If you notice it then you can share your valuable thoughts at here. Today, on 12th August 2012 is closing ceremony for London Olympics 2012 and Google made very beautiful doodle for London 2012 closing ceremony. Today, on 11th August 2012 Google made beautiful Doodle for London 2012 Rhythmic Gymnastics. Today, Google did not make game as Google made for Google Doodle Hurdle, Google Doodle Basketball, Google Doodle Slalom Canoe and Google Doodle Soccer. But I think every one was excepting for new game from Google Doodle as I was. Might be Google did not make game for it because of it is difficult to play gymnastics. Some sources are saying Google lost many revenue from last four days for making animated playing Google Doodle. I think people was excepting some interesting Doodles for tomorrow and for closing ceremony for London Olympics 2012 i.e on Sunday, 12th August 2012. Today, on 10th August, 2012 Google again made one of the best Google Doodle Soccer for London Olympics 2012. I think it is one of the best Doodle for playing soccer game. How to Play this Doodle - Soccer Game? You can play this game by visiting here www.google.com/doodles/soccer-2012. Use the right and left arrow keys to stop the goal. For jump use the space bar key with the help of keyboard. I played this soccer game and I made 26 scores after stopping 26 soccer balls (footballs) with two stars. I think it is the best score. If you made more score than this you can give your comments here. Today, 9th August 2012, Google Doodle made beautiful doodle for Slalom Canoe London Olympics 2012. Instead of saying it Doodle we can say it slalom canoe game which is very interesting to play. How to Play Slalom Canoe? If you want to play slalom canoe game then just visit www.Google.com (for 9th August 2012) for permanent link you can play by visiting here www.google.com/doodles/slalom-canoe-2012. For playing this game use the left and right arrow keys with the help of keyboard. What is the Best Score for this Game? I played this slalom canoe game on Google Doodle and I made it in 33.9 seconds and I got one star for this. I think it is not best score. Anyone can compete this score easily. So you can try this and share your score here. Some people are installing keyword software for arrow keys and space key for breaking records and they are cheating with Google. I think they are doing wrong things. I am recommending to all share your own original scores and try to make it manually without using any cracking software. Yesterday, Google made amazing doodle for London Olympics Hurdles and Today, on 8th August 2012, Google again made very interesting Doodle for London Olympics Basketball 2012. You can play basketball on Google Home page and Its very interesting to play this game. Just visit www.Google.com or www.google.com/doodles/basketball-2012 and you will see this amazing basket ball game. With the help of space key you can play this game. Did You Play Basket Ball on Google.com? If you played basket ball on Google.com and you made good score then you can share you score here. If you are using Facebook then you might notice after Logout Facebook is showing ads. I am noticing it from last two three days. I think its a good idea by Facebook to show ads after logout because user might click on these ads. Did you like this Ides for Promoting Ads by Facebook? You can share your valuable thoughts.